The latest San Diego Comic Con just wrapped up. I’ve never attended but I would like to at some point. Spending a few days wallowing in that density of pop culture seems like it could be an interesting experience. One of the new films being featured there was Sin City : A Dame To Kill For. Frank Miller has become (or revealed himself to be) a deeply unpleasant person with some of his later work and comments. Yet I still have a soft spot for his early work. The new movie looks par for the course, with ridiculous hard boiled dialog, lots of violence, brooding men and femme fatales in slinky outfits. Watching it will doubtless be a guilty pleasure. The Comic Con articles I always enjoy most are those feature Cosplay. I’ve no desire to dress up myself, but I do love the effort and imagination some people put into it, as well as the obvious fun they have. The io9 site has some good photographs from this years event: Day 1, Day 2, Day 3, Day 4 and final round-up. The image below is actually from the 2011 Comic Con, but I liked it so much I just had to feature it. 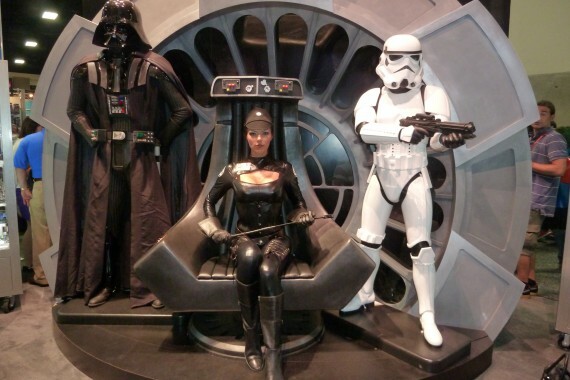 That’s Adrianne Curry as the evil commander holding Vader’s leash. If she’d been in charge those hippy Jedi wouldn’t have stood a chance. I’d certainly have signed up at the nearest Empire recruiting office.